This extensive source of information on grasses is derived from the _Manual of Grasses for North America_, a project that has received support from Utah State University and a host of other organizations including the Flora North America Association, National Science Foundation, US Forest Service, National Park Service, and more. This online Manual provides information about a multitude of species from Achnatherum aridum to Zoysia pacifica. Information options for most grass species include Map, Illustration, and Treatment. For the majority of species listed, Synonymy and Notes have yet to be added. 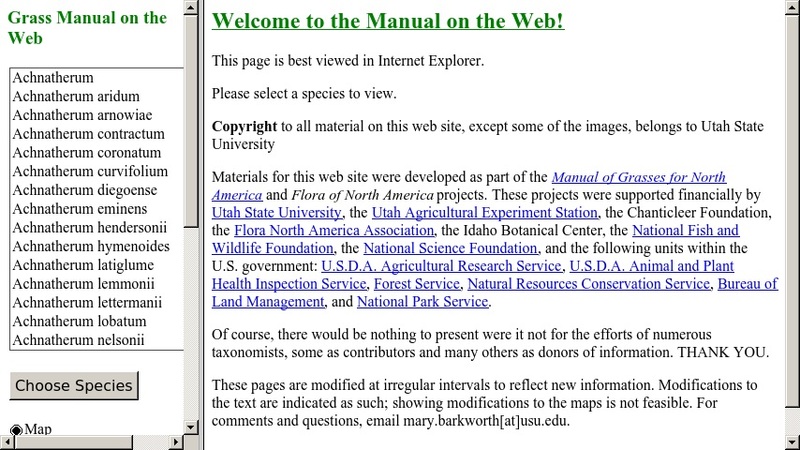 The site also links to information about the _Manual of Grasses for North America_ project, as well as the Utah State University Intermountain Herbarium.